Today I was not sure what I was going to write about. Any of the blog ideas I looked at did not call out to me: "Pick me! Pick me!" Not getting an idea really was a problem, but only for a little bit. 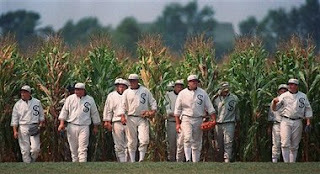 I re-discovered "Field of dreams", through a quote I stumbled on through the internet: Build it and they will come. And: If you believe the impossible, the incredible can come true. Field of dreams, day dreaming and believing in the impossible go hand in hand. And now that I started writing about it, I realize it ties in perfectly with what I talked about yesterday. I loved the movie "Field of dreams", and seeing the success the movie created, I know I was not the only one. So, there it is, 2013 and still the movie can spark interest in people… I think that is quit amazing since the movie was made in 1989! If you belief the impossible: by going out there and building his "Field of dreams", Ray Kinsella, the main character of the movie, is taking things in his own hands, and helping his dream become reality. By taking action you help your dreams to become true.. Starting something, and abandoning it on the first try, is not helping you to realize your dream. The movie shows very clear, that Ray and his family have to overcome many obstacles in order for the dream to be able to get manifested. The same for our own dreams, we have to be willing to take action and keep trying, overcoming obstacles, sometimes doing the impossible in order for our dream to become reality. Oh,you have hit on one of the key points of goal achievement - action. No goal will ever be achieved without action, more action, and then more action again, especially in the face of setbacks. Thank you for your reply Gordon! !